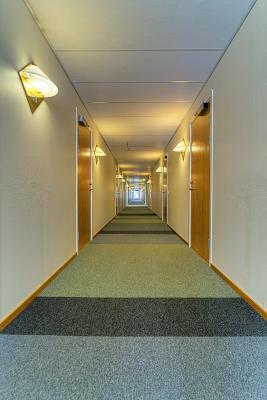 The location is good, close to bouth the hospital and the University. And the city-centre is a 20 minute walk away. 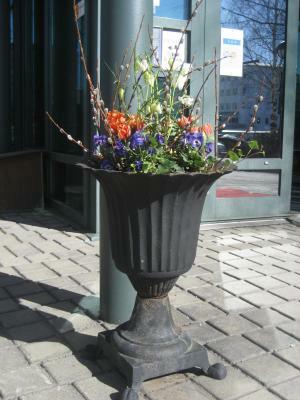 If you dont are in mood for walking there is a bus-hub outside. Usually I dont like to be barefoot on the floor in a hotelroom but this time it felt alright. Such brilliant service, wonderful staff, comfortable stay in a beautiful town. 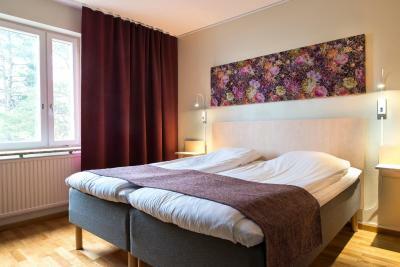 The room is spacious and adequately furnished for the purpose of the stay. The breakfast has a good spread and the timing is good. 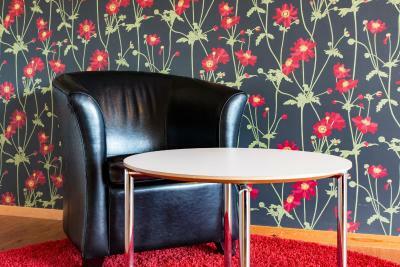 It was just a few minutes walk from the university and the receptionists were helpful and courteous. Walking to train starion in 5, they offer a borrowed bike that you can use in the university campus. 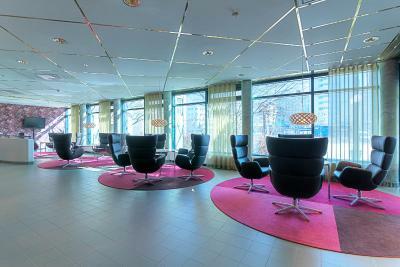 Good taste in the main hall and public area, children friendly with lekroom. Gym, handwork workshop, and even a room to heat ur own food n eat there. Didnt u know that their kitchen is awesome and they cook three meals everyday?! Breakfast was included and such a great value! The food was very good and so many options. Eggs, meats, cheeses, yogurt, cereal, fruit, and many, many types of breads. 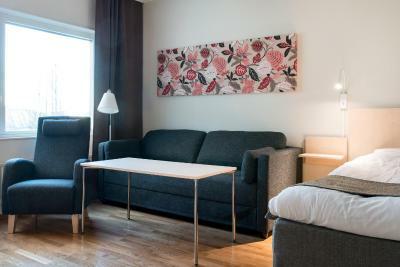 Rooms were clean and the family room is a nice option to sleep 4 people. Very clean hotel. Friendly and helpful staff. 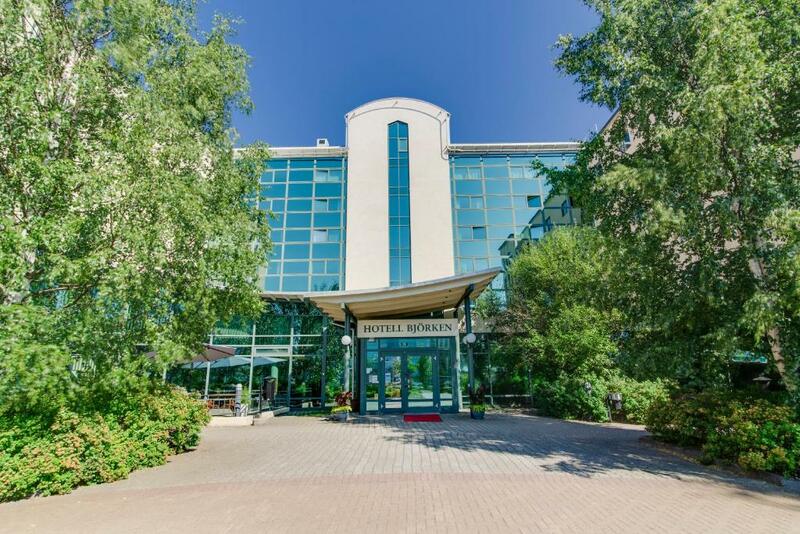 Close to town centre, trains and amenities. Thank you! 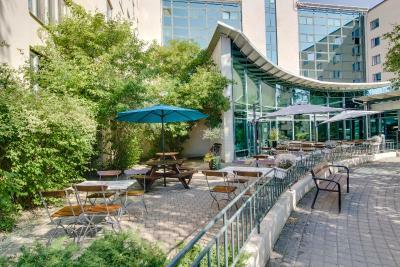 The location is absolutely perfect if you are doing courses and the university or visiting the hospital. Ample parking so once there one need not worry about hourly parking at the university. There are all the baseline things you need. Extremely friendly and helpful staff. Fresh and good rooms with space. Restaurant with good food and several options. 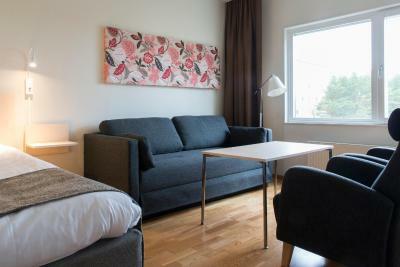 Hotell Björken This rating is a reflection of how the property compares to the industry standard when it comes to price, facilities and services available. It's based on a self-evaluation by the property. Use this rating to help choose your stay! 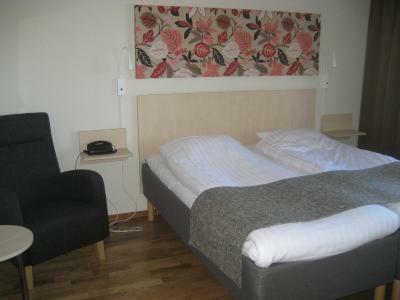 All guest rooms at Björken Hotell have a private bathroom with shower and hairdryer. 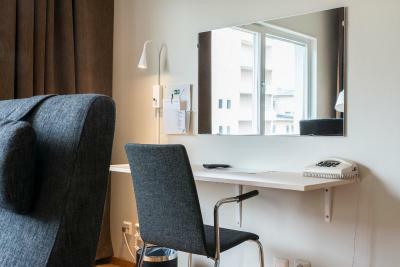 Each room is also equipped with a work desk and chair. A buffet breakfast is served every morning in the restaurant, which also has a lunch menu and evening dinner menu. Snacks, drinks and newspapers can be bought in the 24-hour lobby shop. Bicycles can be rented in the summertime. The Norrlandia Opera House is a 5-minute drive away. 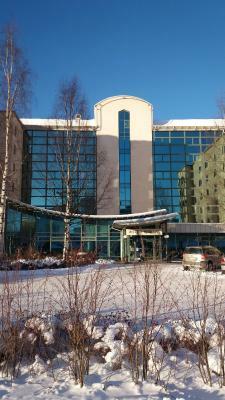 Gammlia Open-air Museum is 0.9 mi from the hotel. 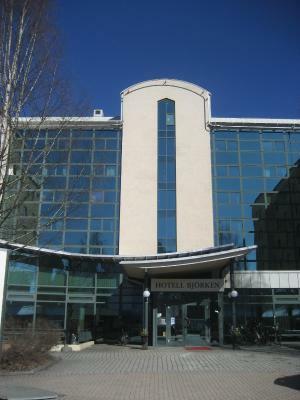 Hotell Björken is a hospital hotel for Norrland University Hospital. 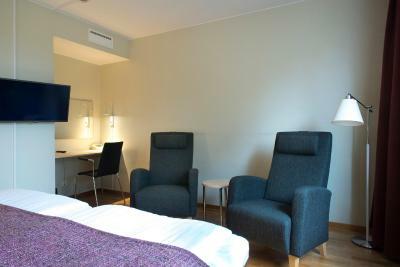 When would you like to stay at Hotell Björken? 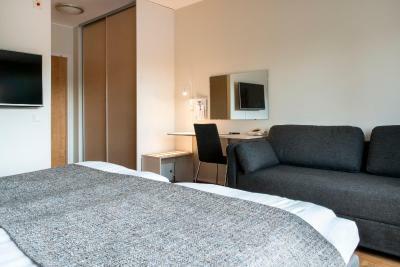 Includes a mini-bar, in-room safe and a TV with cable channels. 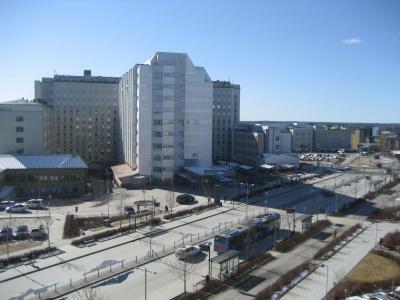 Public parking is available on site (reservation is not possible) and costs SEK 70 per day. 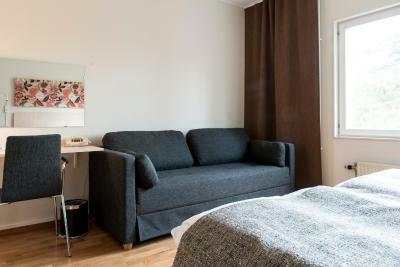 This triple room has a mini-bar and cable TV. 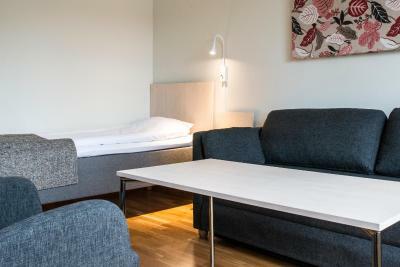 2 guests are accommodated in a sofa bed. 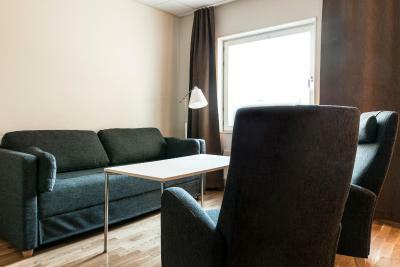 Guests need to make the sofa bed themselves. 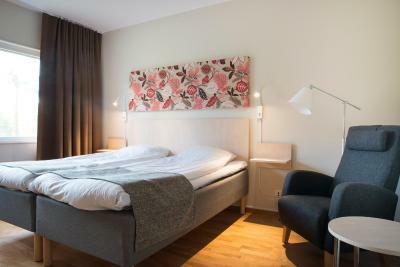 House Rules Hotell Björken takes special requests – add in the next step! 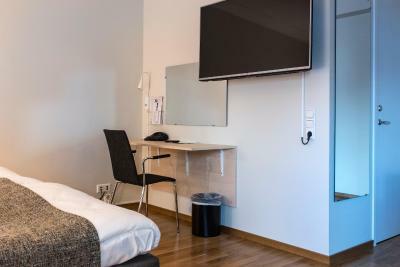 Hotell Björken accepts these cards and reserves the right to temporarily hold an amount prior to arrival. 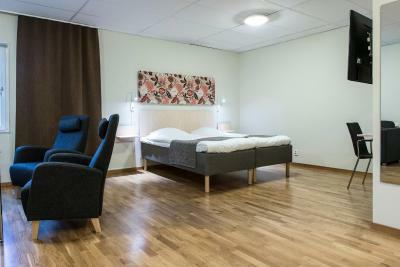 Please note that Hotell Björken is a hospital hotel for Norrland University Hospital. The staff were quite friendly and responded to my questions effectively. The scrambled eggs at the breakfast were really bad. 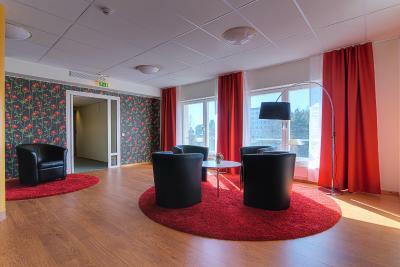 No kettle/teapot in the room (that's a pity especially in Umea which is a quite cold city). The coffee/tea machine in the lobby fills only 2/3 of the cup (for 20 kr). 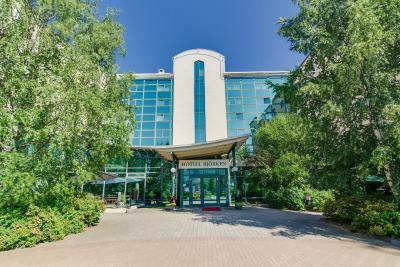 Very good location - just few steps to the university, train station and bus station. Extremely nice and helpful staff. 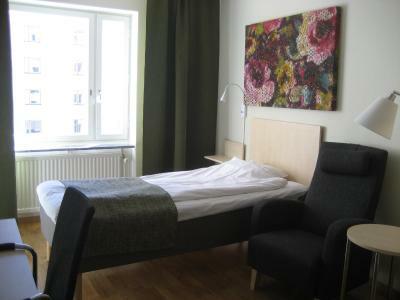 The room was clean, the beds were very comfortable. 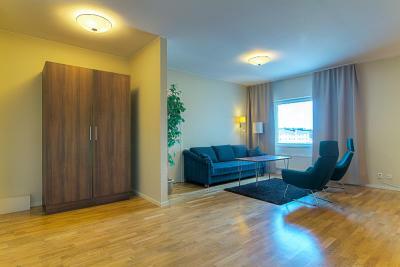 The room has a big wardrobe, two nice armchairs, a fridge and a small desk. Some spots on the showercurtain. The breakfast was a bit sparse, the rooms were clean but for the money lacked any personal touch one is used to with an equivalent price range. 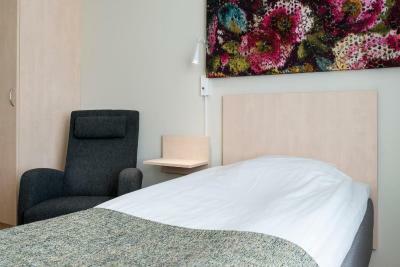 The single bed was rather skinny so if you are used to a plush and wide bed you will be disappointed. Breakfast was not of very high quality. A tea/coffee station in the room would be great. Thicker curtains would be useful in summer. There is a laundry room with washing machine and dryer; this is great if one is on a long trip. There is also a sauna for the use of guests. The breakfast, lunch and dinner are good. I received two dinners for free, which was a nice surprise. 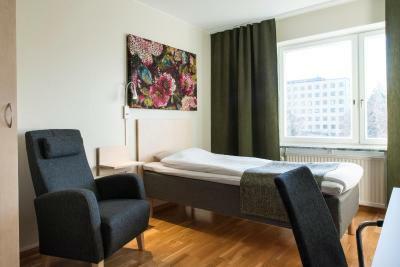 The location is good: close to the university, the shops, the museums, and the bus stop for the airport shuttle.